Make preparing for the SAT Exam easy and fun with the new XZAMS SAT app for your iPad, iPhone or iPod Touch. 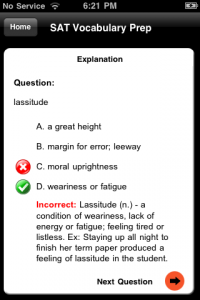 XZAMS SAT Vocabulary Prep has over 600 of the most-commonly used SAT words. The words range in difficulty, and contain detailed explanations to maximize your study time. Each explanation includes a full definition as well as a sample sentence, which increases understanding by showing the practical usage of each word. Questions are offered in both “tutorial” and “test” modes. Use tutorial mode to practice and build your knowledge: you will be asked a question, and a detailed explanation will follow each answer you submit. 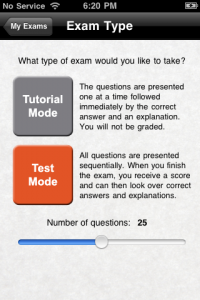 When ready, switch over to timed test mode, where you can choose from 1 to 50 questions to answer. After completing each test, your answers will be graded and explained in detail. · Questions offered in “tutorial” and “test” mode. 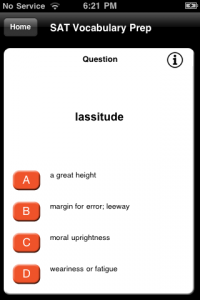 Learn, practice, and quiz yourself with the same app!